foxglove, originally uploaded by Swandives. I so look forward to my workshops at Bateman’s Bay and last weekend lived up to my expectations, I had a wonderful time, thanks to Judy and the girls I left here on Friday morning at around eleven and arrived at Judy’s house around four, so it is about a five hour drive with toilet stops and a stop at the wonderful lolly shop at Berry, I wouldn’t be game to come home without a bag of lollies for Zoe, she would be so disappointed. So from Berry to Bateman’s Bay I ate dutch liquorice (no self discipline at all when it comes to dutch liquorice, the saltier the better. Spring is such a good time to be on the road, everything is so green and clean looking, the blossoms are all at their best the daffodils, jonquils and freesia’s are all up and smiling, I just felt as though I could keep driving forever. Judy of course had gone to a great deal of trouble for dinner, she said she hadn’t, but I know she had. We had roast lamb, YUM how I love roast lamb especially when you don’t have to cook it yourself. The workshop was on Saturday and the girls started to arrive around 8:30AM so by the time we started it was around 9:00. It was so good to see everyone again, such a great group of girls and all good painters. By lunch time we were well on the way and I could see that we were certainly going to finish on time and with plenty of time to frame all of the paintings. Over the years, I have found that it is best to get the hardest part of the painting done before lunch, once you stop and have lunch everyone seem to slow down. Then the worrying begins, Will they finish in time? have they used to much colour? or not enough colour? etc. etc. but not the case at Bateman’s Bay, no trouble at all, we finished in plenty of time. Everyone was happy with what they had painted there was lots of fun and laughter. WHAT MORE COULD YOU WANT? We all went to the local bowling club for dinner and the food was just great, I had lamb shanks, YUM what a way to end a perfect day. THANK YOU MY FRIEND JUDY, AND THANK YOU GIRLS FOR MY R&R, I had a wonderful week-end. I also have to thank Tony,(Judy’s husband) who loads and unloads my car every time I am there, which must be a pain. It has been sometime since my last post, how time gets away. However I felt the need to show this painting to all my friends. It was painted by a friend, an x student of mine. Her name is Kim Staples. I just love it and this is the reason I just love to teach. In the days when I used to run regular painting classes, I had a very talented Monday night class and Kim was one of these students, We all had such fun, they were all so creative it was a pleasure to teach them what I knew. I think I probably I learnt more from them, than they from me. As happens people move on with their lives and move away, We all still remain good friends and we often still get together have a good laugh and even sometimes paint together. Kim has moved to Port Macquarie has has certainly taken her painting a long way. She has done an art therapy course and not only has a regular painting class but she has a class teaching disabled people, she also is teaching the Can Teen (cancer) kids, and is working with the salvation army doing Art Therapy sessions and counselling support sessions for the fire brigade. Recently she was asked to attend a workshop at the national Art Gallery Canberra on setting up an Arts programme for Alzheimer’s. The regional Art Gallery asked her to set up a pilot programme. we were in touch via email, just a catch up. I was overcome with joy when she sent me the painting she had done of me. Well let me say, I love love love it. 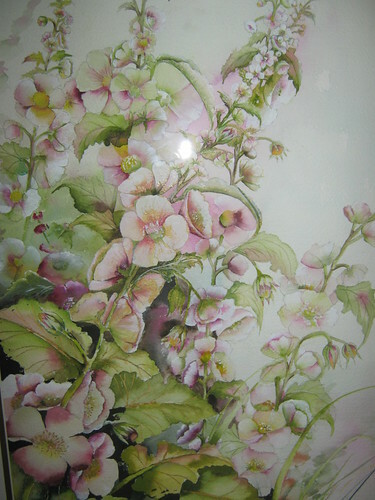 and I wrote back and told her, I thought it was wonderful and to my surprise she has asked me if I would like the painting. Dolphins on the way north, originally uploaded by Swandives. When you have been painting something for a week you are never quite sure how you feel about it. But it has been so long since I have been able to sit down and paint. 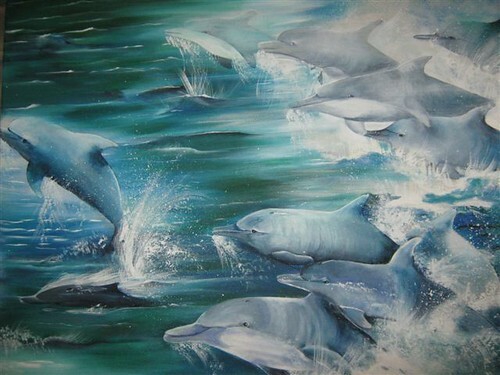 This is my latest painting - dolphins on their way north. Hi there. We will soon have Carol online and ready to go. Stay tuned for painting tips, projects and upcoming classes.